This new edition of the casebook includes extensive excerpts from 25 major decisions by the Supreme Court of the United States in media law or related to media law. 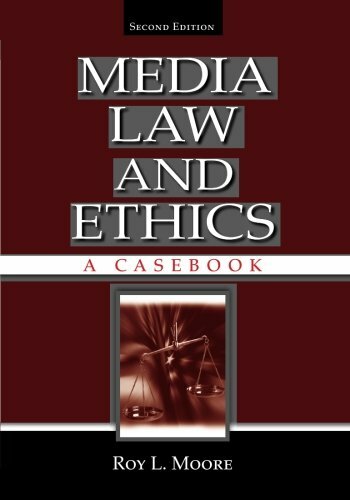 The cases are presented in the order in which they are discussed in the third edition of Media Law and Ethics<$> by Roy L. Moore and Michael D. Murray, but the casebook is designed to be used as a supplemental text in any media law course. Each case includes a brief overview and has been edited to delete detailed citations and highly technical material. However, every effort has been made to preserve the Court's original language, including its recitation of the facts, its reasoning and the holding in the case. Most of the cases also include excerpts from the Court's syllabus, a summary prepared by the Court's Reporter of Decisions. A few of the cases include excerpts from concurring and/or dissenting opinions, where those opinions illustrate the complexity of the case or were influential in later decisions.